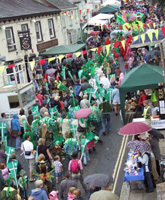 As usual, the Festival Parade 2014 will leave The Square, Barnstaple at 11am on Saturday 19th July and, led by the Town Crier and the Samba Band, will proceed along Barnstaple High Street, across Pilton Causeway and up Pilton Street to Pilton House and Rotary Gardens. It is scheduled to reach Pilton Street at 11.45am, just in time for the first Festival Pageant which takes place in the grounds of Pilton House at 12 noon. 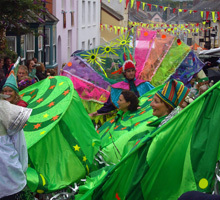 It's great fun to dress up for the Parade and amaze the crowds in Barnstaple with the colourful display of spinners (left), dragons and caterpillars all led by the Green Man and the Prior. Copyright © Pilton Festival. All rights reserved. No responsibility is accepted for the accuracy of the website content.